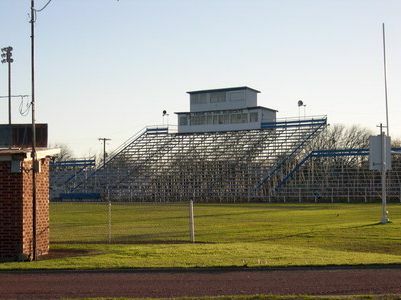 Hufford Field, at Coleman, Texas, was built by the Coleman School Board, Junior Chamber of Commerce and the Athletic Association. When it opened on October 5, 1934, it was one of the few lighted fields in West Texas. The field was first enclosed by a nine-strand barbed wire fence, covering four city blocks. The rock wall was added to Hufford Field in 1940 and 1941 and was built by the National Youth Administration, which was operated by the Works Progress Administration. The program served high school and college students. The iron work 'Hufford Field - 1940' was made by an iron fabrication company and was installed by Garland Marshall over the main (north) gate in 1940. Parts of the rock wall have been removed as unsafe over the years, and other parts reinforced, but most of it remains today. The iron work is currently being repaired and reinstalled at this time (2014), after being hit by a tall school bus in 2013.